Puppies are taught good manners by their mothers and these manners are based on four essential instructions which are vital to the future of the pack. In the wild, if a puppy doesn’t understand how to behave, doesn’t have good manners and lacks respect for its elders, the whole structure of the pack can be in jeopardy. Just because a puppy is born into a domestic environment it doesn’t mean that it is no longer essential for it to be brought up to adhere to the very structure that is embedded deep into its instincts. There is a saying ‘you can take dog out of the wild but you can’t take the wild out of the dog’. If we change the words to ‘you can take the dog away from its instincts but you can’t take the instincts away from the dog’ it may be a little easier to understand. A dog is a truly remarkable animal and has skills and intelligence that sometimes we don’t even realise and take for granted. If it is allowed to be a dog and adhere to its natural instincts it will be far happier. All we need to do is to understand those instincts and learn how to communicate in a way the dog understands. For example, its own bed in a secure place rather than by a door or in a walkway provides an environment where the dog can relax and feel safe. The list of possible achievements for dogs is endless, from simple games such as fetch and hide and seek, to taking part in competitions and tests in training classes, or competing at any of the disciplines. But initial training for any dog is not about bringing a ball back or learning how to compete; it’s about listening to its owner and having good manners. Walking sensibly on a lead is essential to good manners and a good recall should be mandatory. Whether you start with a puppy or a rescue dog you need to make sure that you are the ‘parent figure’. The one the dog can turn to when in times of trouble, can rely on to protect it and who will provide it with a safe home. Children with loving parents are given boundaries within which they feel safe loved and confident and will grow up feeling secure,. The same rules apply to a dog. 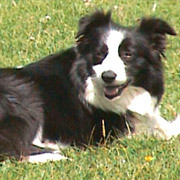 A Border Collie is intelligent and will soon work out how to manipulate its owner. How many pull on a lead yet walk well off the lead and why? Because the owner has said ‘heel’ each time the dog pulls so the word ‘heel’ becomes associated with pulling! A collie needs a sensible low energy diet and a reasonable amount of exercise, but it is a misconception to think that because a collie is a working dog it needs excessive exercise. 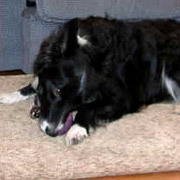 Border Collies are pack dogs and need to feel part of a unit. They need mental stimulation and they don’t need to have lots of toys. In fact, playing endless ball games will often serve to wind them up causing them to become hyperactive. The Freedom of Spirit Trust does not recommend the use of tuggy toys. The Trust firmly believes that no dog should be encouraged to use its teeth on anything connected with a human being and that the use of tuggy toys encourages chewing and, in some cases, aggression. 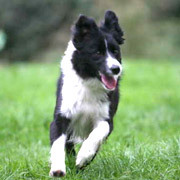 Collies need calming games; they are very sensitive to atmosphere and will soon become hyperactive if they are encouraged to play rough games. If your dog has toys don’t leave them scattered all over the house. There should be a time and a place for playing. Try to keep one room for your dog’s quiet time. If you allow him to play in the living room then you can’t expect him to settle down when you want to sit and be peaceful. Try to keep your quiet area for somewhere you can sit quietly and share some quality time with your dog. When going for a walk, don’t allow your dog to sniff the ground all the time when on a lead. It’s rather like trying to spend time with someone who is constantly on their mobile phone! Make sure your dog is sensible when on a short lead and then allow some free time for running, sniffing and simply being a dog. If you do take a ball with you don’t throw it all the time, get your dog used to enjoying some time with you just sitting and being stroked or massaged. 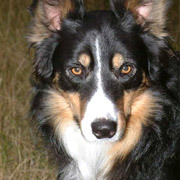 Above all enjoy your collie for his brains, his beauty and his ability to become your closest friend. You can contact the Freedom of Spirit Trust for further information on training and behaviour. Problems or queries relating to basic training can often be dealt with on the telephone by a professional behaviourist for which there is no charge, although donations are always welcome, but for more severe problems it may be recommended that you have a one on one consultation - please note that this would not be provided free of charge by the Trust. NB: The Freedom of Spirit Trust for Border Collies is not responsible for the behaviour of any dogs that are not in its care.